Breaking news: The Red Line Project staff will be reporting from the protests periodically over the next three weeks. Their tweets, photos and other news will be summarized on this Storify. 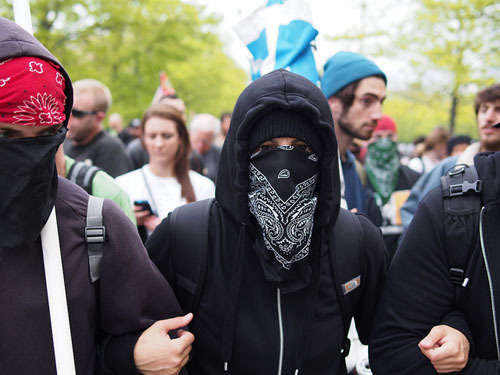 Occupy protestors all over the United States took to the streets of Chicago on Tuesday as part of the May Day protests. In Chicago, more than 1,000 protestors marched from Union Park to the Federal Plaza at 1 p.m., protesting immigration issues and other causes. There were no arrests, but police presence was strong along the parade route and in the plaza. Other cities weren't so lucky. Both Oakland (25 arrests) and Seattle had violent protests, with arrests, tear gas and vandalism. Two Bank of Americas were shut down temporarily in the Loop Tuesday when protestors gathered in front of the buildings to block entrances and chant. Chicago Police sent bicycle officerst to create a perimeter and wait for the crowd to disperse. No incidents were reported. On Monday, protestors staged a sit-in and press conference at City Hall in opposition to the closing of six mental health clinics in the city. More than 1,000 Occupy protestors and affiliated groups marched into the Loop down Jackson Blvd. Tuesday after a rally in Union Park -- many wielding signs or wearing masks, and yelling in unison their beliefs against corporate America and "the 1%." Once the group reached Federal Plaza, speakers on behalf of the immigrant workforce, labor unions, healthcare clinics and other organizations spoke on key issues regarding wages, access to public services, war funding and a nuclear free world. 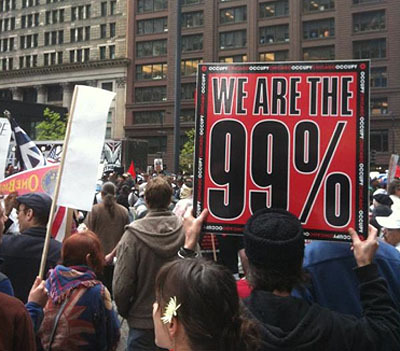 The demonstration was led by Occupy Chicago lead organizer Andy Manos, who received his PhD. in psychology from DePaul University. According to Manos, the next step between now and the May 20-21 NATO summit is what is called the "10 Days of Action," which will begin the "People's Summit" the weekend of May 11. The People's Summit includes several demonstrations, along with key members of the movement speaking on issues in Chicago. Between May 14 and 21, each day of action will be represented by a specific theme, such as education or transportation. For most of Tuesday, Occupy protesters were in downtown Chicago marching in support of immigrant rights, against the upcoming NATO summit and other causes. However, not all of the protestors made it on time. 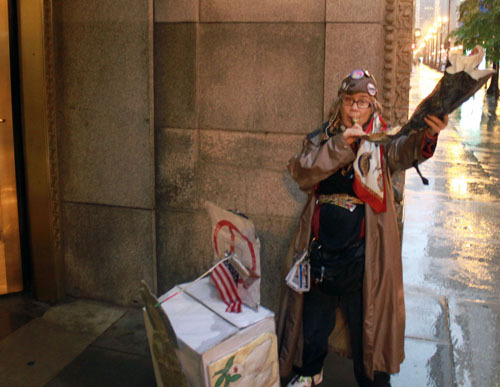 Walking south on LaSalle Street in the rain an hour after the protests had ended was Betsy Benefield, an artist who creates abstract paintings. She missed the protests because she was unable to finish her box protesting Chicago Mayor Rahm Emanuel in time. The box, which was protected from the rain by tape and clear contact paper, featured Emanuel dressed as an ancient Egyptian Pharaoh. She created this because she has some Jewish heritage and feel that Emanuel is following a Pharaoh as apposed to Moses. Benefield was not aware that it would take her all day to make her box so she ended up having to listen to much of the protest on the radio. She used Velcro to attach the box to a suitcase with wheels. That way she could take the box off of the suitcase it was attached to and fold it up. That allowed her to not take up too much space on the bus and train.